What makes a good insurance agent? How to gain success selling insurance? Becoming a successful insurance agent takes dedication, professionalism and hard work. Choosing the right strategies and tools is important as well. As the software marketplace grows so does the number of apps that are focused on helping manage a business. The same way as a software can make financial management and document collaboration more simple and easier, Live Chat can enhance your customer support and communication, and bring your insurance business to the next level. Keep open to change based on latest technology and discover how Live Chat can help you sell more and serve better. A current and engaging website is essential in this era of growing technology. If you want to stand out from the crowd and make sure your website brings you value, you need to optimize it to help your business grow and thrive. A good website should empower your customers and integrate with your existing business processes. Live Chat tool on your website projects a modern, professional image and shows that your agency is customer service oriented. This feature is essential in saving your customers’ time and money. A single operator can handle multiple Live Chat sessions at the same time and easily multi-task while chatting with customers. And your website visitors find out everything they need to know in no time at all! Most people coming to your website are still have to determine what types of coverage they need, and how much of each type they should have. Trying to make head or tail of insurance plans might be a real pain. Almost every visitor encounters problems trying to understand all the jargon like “co-payments”, “deductible”, “exclusions”, “gap payments”, etc. Figuring out what to do, whether to keep a plan, switch, or just “forget-about-it” might be a frustrating and stressful experience for your prospects, too. That’s where a Live Help comes in. With a Live Chat button on your website you can easily and immediately assist your visitors in case of any questions, take their information, guide them through the process step by step and provide them fast, efficient quotes. Another benefit of Live Support chat is its ability to reach beyond your static webpage to make a positive personal impression on your website visitors. By using real names and photos of your representatives in Live Chat you give your prospects the impression of friendliness and personability. We’ve heard a lot of positive feedbacks indicating that users love this feature. It just makes them feel welcome and comfortable, as though they are sitting across the desk from you as you help them to choose the best option for their unique situation. Live Chat is a great help on your website allowing you to encourage communication in many different ways from displaying visible and attractive live chat graphics to greeting users on your website with proactive chat to offering targeted help. With Real-Time Visitor Monitoring feature your representatives can identify visitors who might need help while browsing your website, and take the guess work out of them by offering friendly assistance. What is more, knowing exactly where they are on the website enables you to provide very specific advice without the visitors having to explain their questions. Are you wondering how to improve your search advertising campaign? The Real-Time Visitor Monitoring feature lets you see who is browsing your website, where your visitors came from and what they are looking for, and gauge the effectiveness of your CPC campaigns. On top of that, some chat providers offer website traffic statistics tools which provide you reports on your website visitors details and entry points to better understand their overall needs and expectations. This information can be used for new advertising campaigns as well as for optimizing your website contents. Try Provide Support Live Chat! 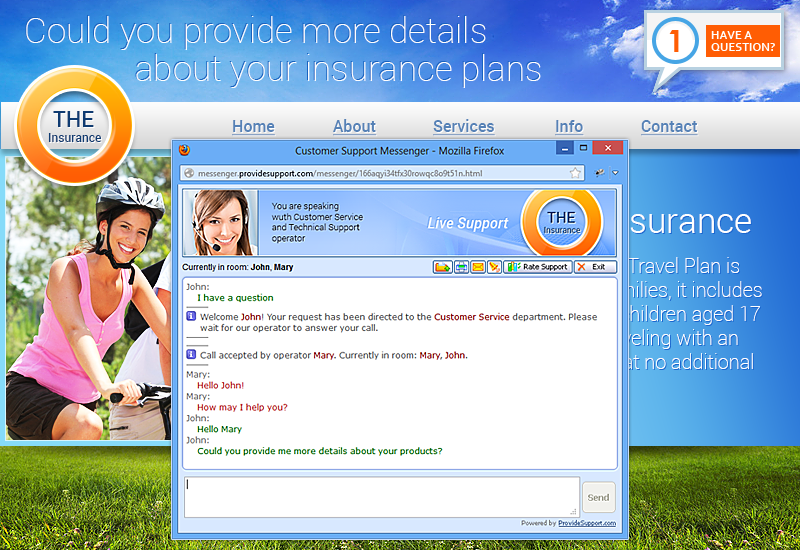 Implementing Provide Support Live Chat software can give your insurance business a competitive advantage in this fast-paced communication era. The numerous cost and time saving benefits that come with a Live Help software including better customer communication, enhanced online experience and increased conversion rate will have a substantial impact on your professional and financial success. The attraction of new visitors through optimized search campaigns would bring a rapid return on investment, making a Live Chat support an extremely efficient and cost-effective method for your customer service. Additionally, your agents will certainly love its simplicity and user-friendly interface as no specific skills or knowledge are required. Start your 10-day free fully-functional trial right now and discover how easy your customer communication can be improved! This entry was posted in Articles and tagged live chat for insurance. Bookmark the permalink.